I mentioned a few weeks ago that we wanted to explore more as a family, so we planned our first weekend trip for last weekend. We didn't tell the kids about the trip, so they were pretty surprised on Friday to wake up and notice packed bags by the front door. We headed out and encouraged the boys to guess our destination by paying attention to the clues they saw. They guessed Flagstaff a few times, as well as the Grand Canyon -- which we were able to say "No, not today" since our destination on Friday was Williams, AZ. 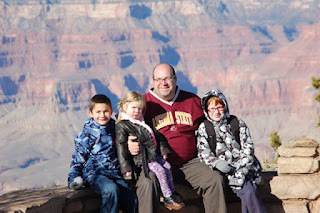 We arrived at the Grand Canyon Railway Hotel late in the day on Friday where the kids had a great time playing in the snow. It was old snow -- so it was icy, packed, and dirty in plenty of spaces. That didn't dampen the fun at all for any of the kids! Bo & I stayed at this same hotel back in 2000 when it was still owned by a private family. Xanterra Resorts purchased it a few years ago but appear to have kept it almost the same. Our room was nice, even if the beds and pillows were hard as rocks. We had an awful dinner at a local restaurant (Pancho McGillicuddy's . . . I do not recommend you visit!) and after more snow play we all settled in for the night. In the morning, we packed up our van and headed over to the train depot for the 2+ hour trip into Grand Canyon Park. The train has singing cowboys and wonderful tour guides in each car to share interesting information about the area. We went coach - which is comfortable enough but doesn't provide any snacks or drinks. You can also upgrade to a few different levels where snacks and drinks are available -- but not all upgrades allow children. There was plenty of snow to see, and animal tracks along the way. We arrived at the depot at the Grand Canyon and quickly climbed the 47 steps to see the rim. It was as impressive as I remembered! We walked a short way to Bright Angel Lodge and enjoyed a wonderfully delicious lunch and then spent the remaining time before the return train walking along the rim and visiting the Visitor's Center. We visited the Visitor's Center too late for the boys to earn their Junior Ranger badges, but we did take the books with us. The return train leaves at 3:30, and while it seems a short time at the Grand Canyon (3 hours) -- it was actually a perfect amount of time with 3 kids. They were all very good, but the icy patches and the proximity of long drops, and a 2yo with a mind of her own became stressful after a couple hours. We arrived back in Williams after 5 and climbed into our van to head into Flagstaff (about 40 miles away.) We checked into our motel and then headed over to the Lowell Observatory. Colin has shown an interest in space and astronomy for a few years now, so I was excited for him to have a chance to look through their big telescope. The employees there were very excited about the observatory, and Bo & the boys were able to check out stars through 2 different telescopes (it was very cold -- and there were lines for each telescope -- so Lydia & I waited inside.) There is a nice exhibit inside as well, and various showings of videos. On Sunday, we visited the Museum of Northern Arizona, which has a series of great exhibits about the peoples and geography of the area. There was an exhibit of watercolors by Gunnar Widforss that were stunning! He painted landscapes of many of the national parks and also painted our very own Superstition Mountains a few times. We considered heading home, but I noticed that Sunset Crater was close. This National Park is the home of the youngest volcano in Arizona (having erupted only 900 years ago.) 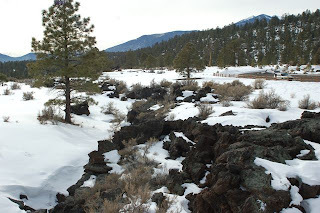 With the snow, it was really neat to see the lava flows. There was a short loop to walk, and we spent a wonderful hour or so exploring. The boys earned their Junior Ranger badges, and learned more about the area and volcanoes. And, then we headed home -- while listening to the Packer / Cardinal playoff game during our drive. It was a wonderful trip and I was so glad that all 3 kids were wonderful travelers. They were eager and willing . . . and rarely complained! Your enthusiasm for these trips you do always inspires me, Mel. Also, I didn't know you could drive so easily to a place where it's cold - and cold enough to snow! Hey. What's with the smell in Tonawanda anyhow? I swear it smells like sewage every time we drive by - did you know it got rated the best place to live in New York State recently by Forbes Magazine? It is pretty there, but the SMELL! Happy New Year to all! We got your lovely photo card!!! Thanks! Wow! That sounds like such a wonderful weekend trip. You are inspiring me to look for something wonderful like this to do with the family close to our home.